Are You Dating a Loser? Or Have You in the Past? 6 months ago, Evelyn came to me with a sad, but common situation. She allowed me to share her story with you. Evelyn is not a “rest stop” by any means. She is a high value woman (keeper) with an excellent career and lots of friends and hobbies. She is a busy, positive, and a happy woman. There is no reason why she should get burned by men. I examined how she was acting once she started liking a guy. I figured she was making all the mistakes, like never creating challenge or making him her hobby. In fact, she had been following me so she knew how to handle a man. I decided to look at Evelyn’s situation on a deeper level. We looked at all 3 guys and an array of other men she had dated in her past. I was looking for the common denominator. As is common with most women, she kept choosing the same type of man over and over without realizing it. Evelyn chooses the guys who are the loudest and funniest in the room. This type of man is totally opposite her serious and demanding father. Picking loud and funny guys is OK, but she needed to screen these men more. She was choosing wet kittens and not Lions. Evelyn’s therapist knew why. Growing up was a lonely time and the male figures in her life were horrible. She was being drawn to men who fulfilled a need, even though they were bad too. They just were not as bad as the horrible men who raised her. These men were actually doing her a favor by dumping her – as odd as that may sound, because they were toxic. Unfortunately, this constant stream of failed relationships tanked her confidence. Evelyn was missing one key ingredient. I was failing to give her the one thing she really needed – the tools to spot men who play games! She was looking for strong men but she didn’t know how to distinguish between a good strong man and a user who comes off as being strong. These men were strong, but they were players, cons, or guys who could not love. Some of the men knew it and others didn’t. Evelyn was listening to their spiel but not testing them. Why should she? These men were showing all the signs of liking her in the beginning. Understand this – these men are pros, many are careerists at duping women so they can have their needs met before moving on. Evelyn was allowing her heart to get involved too soon. Women need to screen men through a series of tests so you can study their actions. Words mean nothing. It is through actions that men expose their true feelings and if they don’t match up, you get the heck out of dodge! This is why I am wrote Weed Out The Users, The Couch Potatoes, and The Losers: Expose and Dump The Toxic Men in Your Life! 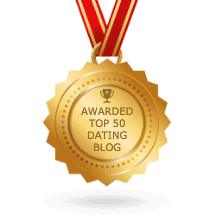 Read the Reviews and Stop Dating Losers Forever! This books shows you exactly how to do this! I define the 4 types of men and then we test the crap out of them before your heart gets involved. If they pass, then you are good to go. If they fail, you dump their fluffy, wet kitten, asses. Evelyn, cried with tears of happiness when I let her know she was never the problem – it was simply the guys she was choosing. 3 months later, Evelyn found her man! I gave her the new game plan and now you will have it too! 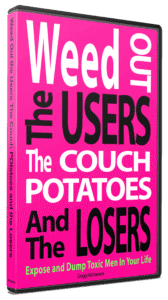 The book is called Weed Out The Users, The Couch Potatoes, and The Losers. You guys have helped me write it and I am grateful to you. Let’s expose and dump those wet kittens, so you can clear the deck and find your LION! So ask yourself, Are You Dating a Loser?